After the Hungwu Emperor threw the Mongols out in 1368 AD, he established the Ming Dynasty. But the Hungwu Emperor’s power was still pretty weak after the Mongol invasion. He only ruled China from the Great Wall to the east of Tibet – smaller borders than modern China or than T’ang Dynasty China. He modelled his government on the T’ang Dynasty, trying to keep as much power as possible in the central government and especially in his own hands. To deal with the extra work this made for him, he created a council of his advisers to help him. Examinations came back as a way to select governors and judges. But the collapse of the Mongol Empire meant that the Silk Road wasn’t so safe anymore, and didn’t carry so much trade. China was often fighting with the Uighurs to their west instead of trading with them, and Chinese merchants had a harder time getting silver, steel, sugar, wool carpets, glass, spices, and medicines than they had before. More Chinese traders began to sail around to India by ocean, and the emperors turned their attention to Southeast Asia instead of Central Asia. 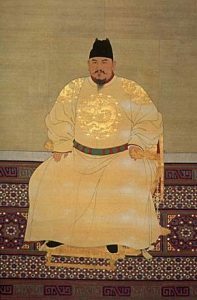 The Hungwu Emperor lived a long time, longer than his son, so when he died his teenaged grandson became the Jianwen emperor. He only lasted four years before his uncle Zhu Di killed him and became emperor himself as the Yongle Emperor in 1402. The Yongle Emperor moved the capital from Nanjing to Beijing (bay-ZING), where he began work on the imperial palace called the Forbidden City, which still stands today. He kept using examinations the main way to get government jobs. The Yongle Emperor also sent trading ships as far as East Africa, and reconquered North Vietnam, in order to get its gold and silver to make coins with. But in 1427, Le Loi pushed the Chinese out of Vietnam. By the 1450s AD, after a civil war, the Ming Dynasty emperors felt poorer and more defensive. They stopped exploring and instead rebuilt the Great Wall of China, along China’s northern border. They made laws against trade with Japan. And then, in 1513, the first European explorers arrived in China by ship – the first one was Christopher Columbus’ cousin! – and the Ming emperors saw a way to get silver directly from the Europeans, without using the Silk Road anymore. Eyewitness: Ancient China, by Arthur Cotterell, Alan Hills, and Geoff Brightling (2000). . The Examination, by Malcolm Bosse (1994). A young adult novel about a young man taking the government examinations, and his more adventurous brother. The writing’s not great, but it’s a good introduction to medieval China under the Ming Dynasty. The Confusions of Pleasure: Commerce and Culture in Ming China, by Timothy Brook (1999). The best available survey of Ming Dynasty China for adults. The Cambridge History of China: Volume 7, The Ming Dynasty, 1368-1644, Part 1, edited by Frederick W. Mote, Denis Twitchett, and John K. Fairbank (1988). Everything anyone knows about the Ming Dynasty. Cite this page: Carr, K.E. Ming Dynasty China – Chinese History. Quatr.us Study Guides, June 6, 2017. Web. April 20, 2019.